No, we have not really experienced progress toward a culture of peace. No key allies (certain governments, the UN) + no coalition building. In 2000 and 2003 ECCP has organised an international conference on Conflict Resolution in Schools / Peace Education. We are the international secretariat of the Global Partnership for the Prevention of Armed Conflict (which exists since 2003). The Global Partnership aims at achieving a paradigm shift in the field of conflict and peace: from reaction to prevention. The Dublin Action Agenda (which is available upon request - it contains recommendation from civil society representatives from the Western and Northern European region - which is one of the 15 regions in our programme/network) specifically speaks about 'Building a culture of prevention and culture of peace' (guiding principle 2). Guiding principle 6 speaks about a partnership between civil society, government and international organisations. Via this partnership we aim to achieve a culture of prevention and peace. This Action Agenda is endorsed by 135 civil society organisations. We are currently drafting a Global Action Agenda. The issues for the Global Action Agenda are extracted from the Regional Action Agendas as well as from international research done by the Global Partnership. The Regional and Global Action Agendas will bring forth civil society priorities and recommendations for change for the decade to come. The Global Action Agenda will be presented to Secretary General Kofi Annan during our Global Conference held at UN Headquarters in New York on July 19-21, 2005. We are involved in the establishment of the International Center for Conflict Resolution in Education (ICCRE). International Steering Group (ISG) of the Global Partnership for the Prevention of Armed Conflict (GPPAC - of which the ECCP is the International Secretariat). 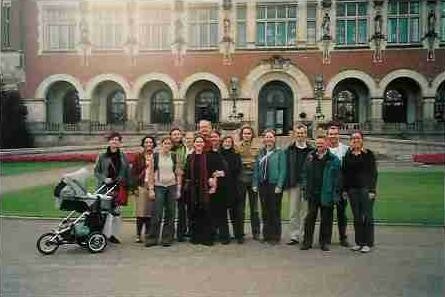 A group picture of the ECCP itself in front of the Peace Palace in The Hague. Support the International Center for Conflict Resolution in Education and involve governments. We are the international secretariat of the Global Partnership for the Prevention of Armed Conflict, the secretariat of the European Platform for Conflict Transformation and involved in the International Center for Conflict Resolution in Education. We are currently drafting the Global Action Agenda which will also promote a culture of peace. 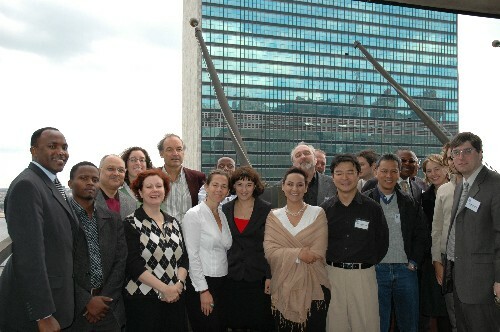 The Global Action Agenda will be presented to Secretary General Kofi Annan during our Global Conference held at UN Headquarters in New York on July 19-21, 2005. In the years after the conference in 2005 we will lobby hard for the implementation of the Global Action Agenda. We will also try to get more support for a culture of peace in the development world by lobbying for the recommendations of our Global Action Agenda, e.g. during the Millenium + 5 Review Summit.